What steps will reproduce the problem? Letting the data load from CanIMogIt then opening then auction house. What is the expected output? What do you see instead? Memory leaks till I get an error message saying I'm out of memory. What was the item name? Please attach a screenshot of the Debug tooltip (/cimi and check "Debug tooltip"). What was the level and class of the character you were on? Level 23 Priest. Do you have an error log of what happened? No. Please provide any additional information below. I started having the problem since the last update of CanIMogIt 7.3.2v1.5. Everything works fine till you open the auction house then my memory will just keep increasing till it's all gone. I found the problem by turning off addons and waiting for 10+ minutes. I started with Trade skill master then collectionshop and last CanIMogIt. After turning off CanIMogIt and waiting for 10+ minutes there was no more problem. I even turned back on trade skill master and have been running that with no problems. I have 16gbs of ram running so to max that out is really bad. I have turned off CanIMogIt and will not use it till this is fix in order to keep from any damage to my new computer. Thank you for putting in a ticket! I've tried to reproduce this and I do not see it happening even checking with Addon Usage. 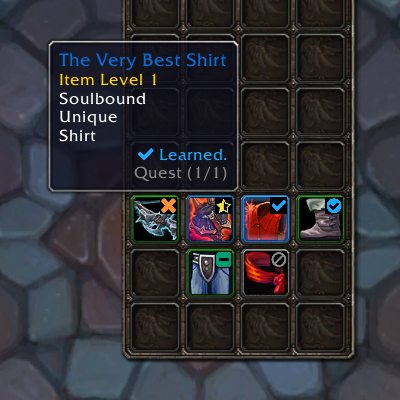 Can I Mog It does not do anything unless a Blizzard event happens. Opening the bags the first time, looting an item, learning an appearance, pressing Search in the AH, pressing Next in the AH, etc. cause it to do a small update. Otherwise it just waits and does nothing. Can you please provide a list of ALL addons you are using? The only way I can think of the cause being with Can I Mog It is from another addon using our API incorrectly. You got an error message saying you were out of memory? What exactly did it say? Was it a Windows error (examples), Blizzard error (example), or WoW addon error (example)? If it happens again can you please take a screenshot and share it or copy the text exactly as you see it? CanIMogIt and Collectionshop are still turned off so they weren't on the list. The Error was a windows error that just said "you are out of memory" and sometimes it would do a black screen. Alright, since it was a Windows error then that means there's something going on with your computer (RAM, drivers, etc.) or game installation. Addons should not be able to cause your computer to run out of memory. Sorry I can't be more help. Hopefully they can help you figure out the problem. It turns out it was an addon but not your addon. Handynotes_argus was the addon taking up all my memory with that addon off and all my others on there is no problem. I found it by turning all addons on 1 by 1 with that being the last one not turned on. I knew it couldn't be my computer it's only 2 months old and all new parts. Seems I was wrong about it being a windows error and about it being handynotes_argus. Most of the time it would just do a black screen before an error would pop up but lastnight I got the error messages before the black screen. One error message was a wow error message and the other was a battlenet error message. Both error messages and memory increase stop when I turn off CanIMogIt off. It may be another addon messing with your API I;m not sure about that tho. All I know is when I turn off your addon I don't have a problem anymore. It could be something with handynotes_argus that addon has had memory problems before and does use your API to show what armor items you have or don't have already. I know it's been awhile since you posted, but we got a couple more reports related to crashing by filling up the RAM and that helped us narrow down the cause. Please let me know if that fixes it. Thanks!